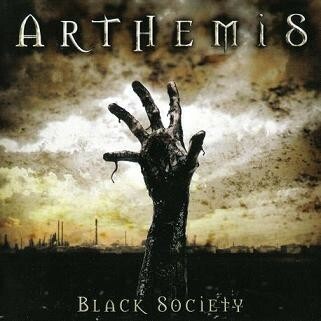 Italian based Arthemis return with their fifth album ‘Black Society’, the follow up to 2005’s ‘Back From The Heat’. Featuring the twin guitar attack of Andrea Martongelli and Alessio Garavello, both members of Power Quest, Arthemis are known as a thrash band, but there’s so much more to their sound than that, with loads of melody, touches of prog and good old-fashioned Heavy Metal. Album opener ‘Fright Train’ has an intro Dream Theater would be proud of - it crashes in with thunderous double-bass drumming (courtesy of Paolo Perazzani) and moves through several time-changes before settling into a tight, rocking groove with a crunching riff. Alessio Garavello delivers a powerful soaring vocal, which takes the song to a catchy chorus before breaking down and slowing into a pummelling riff, followed by a slide guitar section which leads into a stunning solo as the tempo increases again, building back into the vocal sections, and ending with more pounding drums and a Garavello scream - great opening song! After such an intense opener, I wasn’t prepared for the contrast with track 2, first single ‘Angels In Black’. This is pure melodic rock, albeit with a dark edge, a straight ahead rock song with bags of melody, simplistic riff and great chorus, with another searing solo. The band, completed by bassist Matteo Galbier, serve up more fiercely pulsating, thrash-tinged workouts like ‘Electri-Fire’, ‘Escape’, and ‘Mr.Evil’, coupled with more atmospheric numbers like ‘Medal Of Honour’ and the stunning title track - ‘Black Society’ has a moody Metallica feel, dark and intense, but melodic, and despite it’s seven and a half minute running time you never lose interest. The production is punchy and powerful, and is mastered by Threshold’s Karl Groom. 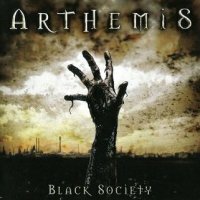 Arthemis have delivered a stunner, one of the best in it’s genre this year. Heavy Metal at it’s finest!